While lately, I’ve been venturing into the world of herbs, I’ve never left the world of beasts – be they fantastic or not. I’ve always had a totemic fascination with the world around me from a very early age, which is why I’ve particularly worked and studied in that direction for a long time. I believe that this type of work should be included in everyone’s craft and system. After all, our human world is interconnected with the animal world and establishing a spiritual relationship with them is of utmost importance. Not only does this type of work teaches us humility and respect, but it also teaches us about the power of nature and metamorphosis. It also allows us to develop the virtues of our respective spirit animals and work with them creatively and productively. One of the things I keep noticing is that many people seem to be confused about “animal magick” and that they cannot differentiate between a totem, familiar or power animal. Lately, they’ve all been reduced to “spirit animals”. Indeed, all of them are spirit animals, but they have distinctive traits and purposes that you should know about in order to help you identify and work with them more efficiently. Let me explain. While they are often associated with the indigenous people of the Americas, totems can be found in almost all of the cultures in the world. And that is because mankind went through a totemistic phase in ancient times. Their totems have survived through myths, legends, and symbols that are still present today. And that in itself is a testimony to the power of the Totem. As a belief, totemism is strongly connected to animistic religions and it is usually represented by animals or natural figures that carry a spiritual significance to an individual, clan, tribe, or an entire culture. 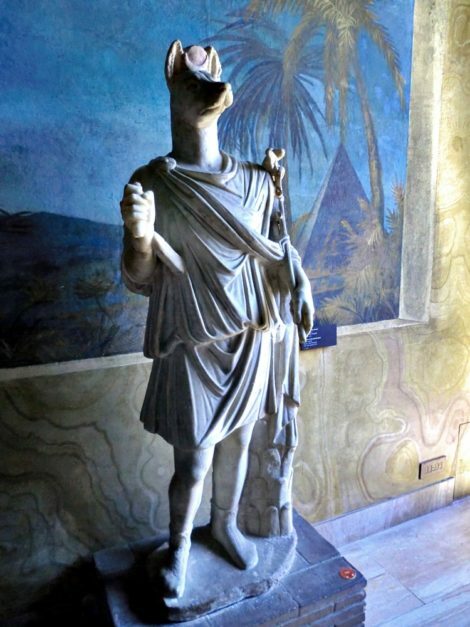 Throughout time, many noble houses, countries, and even military institutions had their zoomorphic figure incorporated into the design of their emblems, flags, totem poles or other similar structures. Likewise, individuals who are involved in some type of animal magick use their totems as representations on personal objects that can look like simple fashion statements, such as a piece of jewelry that they wear all the time. Native totems, however, are personal. In most traditions, your native totem is determined by your astrological context, such as the time of your birth. Your native animal totem never changes and it stays with you throughout your entire life. It is a symbol of your qualities, a symbol of an aspect of yourself that contributes to your overall identity. 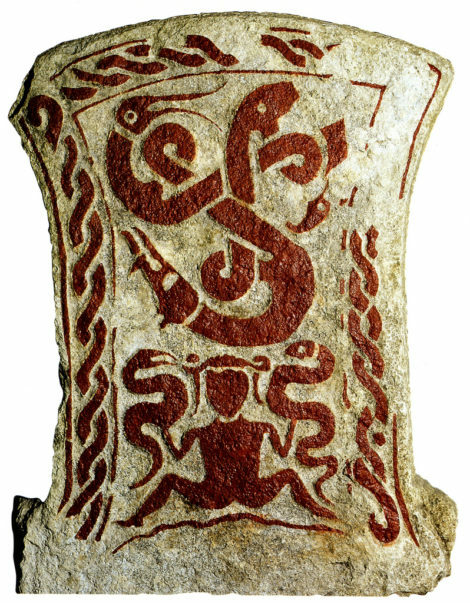 The Snake-Witch or Snake-Charmer is a picture stone that dates to 400-600 AD found in Sweden, which depicts a figure holding a snake in each hand alongside a triskelion consisting of a boar, eagle, and a wolf. Foto: Flickr. Your totem is representative of its entire genus, it’s not a particular animal necessarily. Most traditions suggest that a totem is the spirit of a wild animal, but domesticated animals, insects, mythological creatures, as well as all animals of the Earth, Air, and Sea can be totems. Your totem is an archetype, it is an extension of who you are, more than it is a spirit separate from you. While some are deeply in touch with their totem naturally, other people require some type of practice to unlock the power of their own totem. 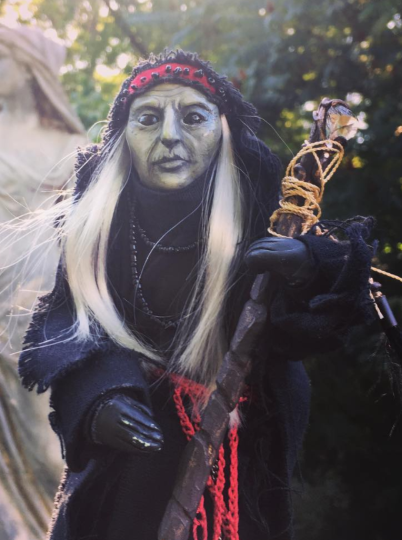 Shamans, magicians, and witches each have different techniques to identify, honor, and work with theirs. Additionally, your totem is in part responsible for your relationship with the animal world, with nature, and with your life-long metamorphosis. Your familiar spirit is very different from your totem. Your totem is an inherent part of who you are and you enter this world accompanied by it. A familiar spirit, however, enters your life when you become involved with some type of magick, witchcraft, or shamanism. You may invite your familiar in your life, or it may find you before you do. The witch and her familiars – image from a pamphlet from 1579 that depicts the witch trials in Windsor, 1579. 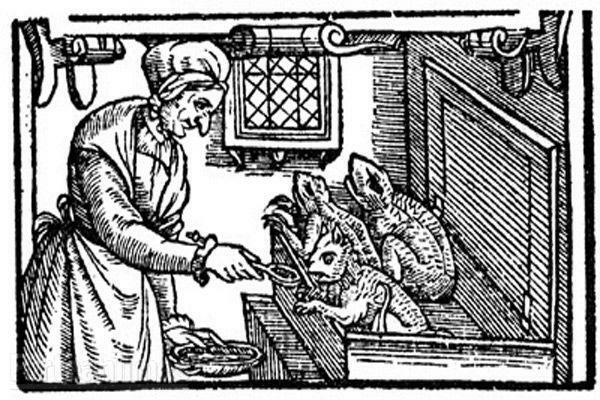 The women mentioned in this pamphlet were accused witches who were believed to have kept spirits and fiends under the disguise of toads, cats, and rats that acted as their servants and companions, who would feed on their blood. 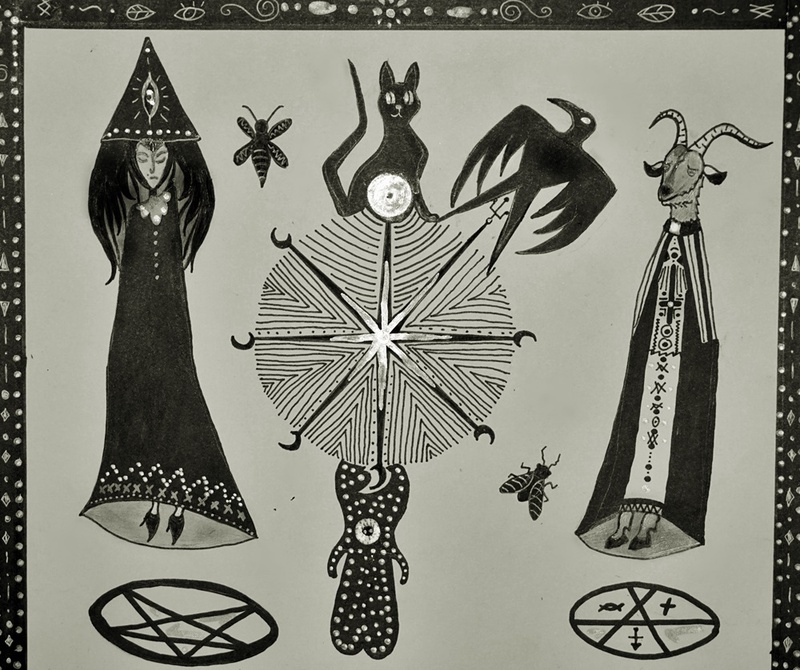 “Spiritus Familiars” was used in reference to the animal companion of the witch or magician and it was often synonymous with a serving spirit that might’ve been assigned to their master by a higher power, demon, or entity. 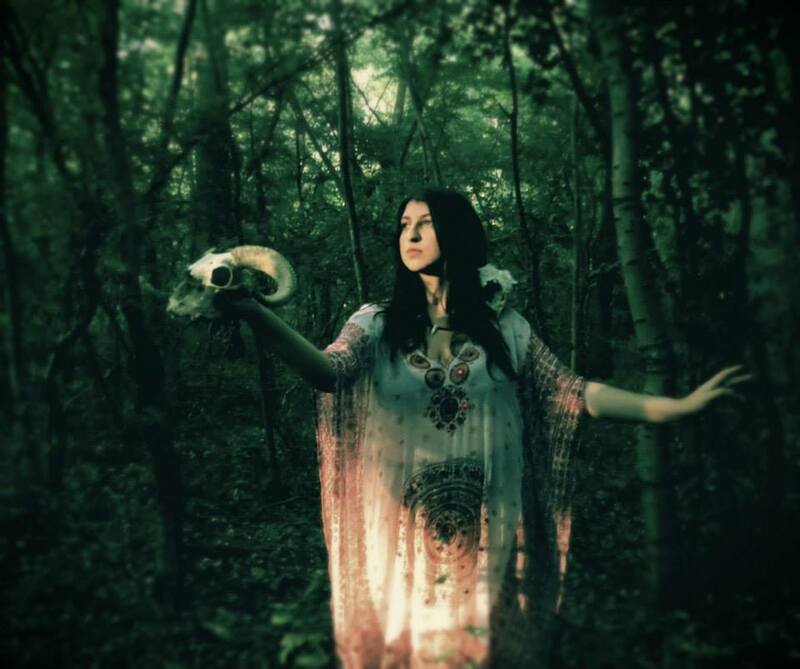 The concept of the familiar spirit became popular thanks to European witches and druids, but records of men establishing a relationship with an animal helper can be found in the ancient history of the entire world. And indeed, there seems to be a clear line that separates the familiar from the totem in most of these records. For example, the Romanian historian and philosopher Mircea Eliade noted in his book Shamanism: Archaic Techniques of Ecstasy that: “The Goldi (Nanai people in Siberia) clearly distinguish between the tutelary spirit (ayami), which chooses the shaman, and the helping spirits (syven), which are subordinate to it and are granted to the shaman by the ayami itself.” Here the ayami is the totem, while syven is the familiar spirit. It is not a general rule that the familiar spirit is subordinate to the totem. Different cultures have different traditions on how a familiar works. However, it is commonly accepted that your familiar spirit comes to guide and assist you in your magical work. Generally, there are two types of familiar spirits: physical and non-physical. The physical familiar is a real animal, perhaps even your pet, but its spirit is an evolved entity. A non-physical familiar doesn’t have a physical body, but it may still manifest physically in the form of an animal. Whether they have a physical form or not, familiar spirits exhibit shape-shifting abilities, a superior intellect, and a distinctive sense of loyalty. Tales from the medieval times say that familiars used to spy for their masters and do their bidding. They usually made a pact to serve them for a period of time and it was rarely a life-long engagement. In any case, your familiar will exhibit extraordinary qualities that surpass the physical form they take. Throughout your life, power animals will come and go to guide you, assist you, and protect you. They can be summoned or they can come on their own if you ever need them. They come to teach you a lesson, to guide you through a spiritual journey, a struggle, creative process – you name it. Sometimes, although not always, they may be connected to the circumstances that they appear in more than they are connected to you as an individual. They may also appear in the form of symbols more than physical forms. As with most things, they will come to you when the time is right. But you should prepare for it nonetheless. Meditation is the easiest way to open yourself to them. Your totem is already there, you simply need to identify and acknowledge it. Likewise, your power animals will make their presence known through synchronicities and symbols that you only need to be aware of. As for your familiar, well, that’s different for everyone. Our ancestors from all over the world have been working with totems, familiars, and power animals that we can still learn about from traditions, myths, legends, and their association with various old and mythical gods. Through his De Occulta Philosophia, Heinrich Cornelius Agrippa von Nettesheim has been one of the first in the late Middle Ages to propose a synthetic vision of magic that combined the natural world, alongside the animals in it, with the divine and the celestial, thus introducing a type of animal magick. If you are naturally inclined to this type of work, you might already sense your spirit animals. If not, it’s easy to identify them through a little bit of practice. And of course, there’s always the freedom to work with whatever spirit animal you choose. Additionally, systems such as the Chinese calendar, and even people in your life through their own spirit animals will affect you in one way or another. And the more you know yours, the better. Working with animal remains such as bones and fangs, enables one to communicate with the spirits of the dead and spirit animals. The spirit animals attached to the bones can act as messengers between the dead and the living. Certain pattern arrangements can also help one meditate and connect with the spirit animals. 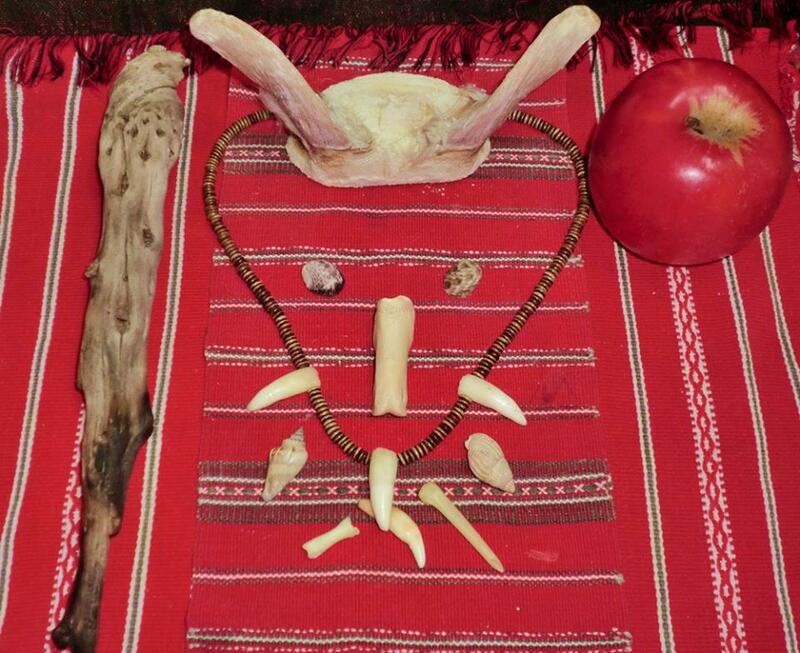 In this arrangement, sea shells, canine fangs, bones, and lamb horns are used to form a meditative pattern that allows communication with certain spirit animals. The apple is an offering to them, and the wooden wand is a tool to be charged by their energy. Likewise, entire communities tend to gravitate towards certain spirit animals at times. For example, in the past years, I’ve noticed a collective embrace of the owl from internet posts to various forms of art and jewelry. There’s always an animal that starts trending in various communities and you can see it being represented in different ways. That’s a sign of that spirit animal guiding the community at that time. You can encompass your community’s spirit animal into your work just as much as you incorporate your personal spirit animals in it. The more the merrier, I say – as long as they don’t eat each other. For example, my native totem is the Raven and I work with the Wolf – who is the totem of my Daco-Thracian ancestors, quite a lot. The wolf and the raven have a symbiotic relationship in nature that transcends into the spiritual realm. So they work together splendidly. I told you what my native totem is, now it’s your turn. What is your native totem? And if you don’t already know, what do you think it is?